MiniTool Partition Wizard is a disk management tool for Windows with a lot of useful features. As it has a free version, you can try it without any hesitation. If you want to manage disk partition on Windows more conveniently, you will need a third-party tool get your job done. So, This Minitool Partition Wizard review is for you. The built-in disk management tool in Windows 10 is not good enough. So, Users have to depend on partition managers from third-party. MiniTool Partition Wizard is one of the very popular tools available for Windows. In this review article, you will know about it in details including the pros, cons, price, and discount. It is one of the popular partition managing software available for Windows. It can do various tasks in addition to disk management. The Minitool partition wizard has some cool functionalities. Go through this review, you will get to know every pros and cons. Here are the core features of this software. These are the most useful and major features available in MiniTool partition wizard. Some features are only available in Professional version. The free version has only basic functionalities which are sufficient for most users. This software has all basic functionalities that can improve your partition management experience. You can create, resize, delete, merge or split partition. It also allows you to set disk between primary and logical. Else all other common features like changing the drive letter, hide/unhide, convert between NTFS and FAT32 are available. It means you can do all basic stuff with this software. By using the MiniTool partition wizard professional, you can recover your lost or deleted partition from a hard disk or SSD. It is a cool feature. But, Free version users only can scan for lost partition. Only, Pro version users can recover. Users can completely wipe a disk by using this software. It will make harder for data recovery tools to recover your private data. This feature is only available in the pro version. You can convert GPT disk to MBR and vice versa. It helps in many difficult situations. Sometimes, Users may need to transfer Windows from their hard disk to newly installed SSD. In this case, Minitool partition wizard can do it smoothly. It is one of the coolest feature available in modern partition management software. You can create a bootable Windows PE disk/Pen Drive. It will help when windows crashes and you can’t access your PC properly. Else, There are some other advanced and basic features that you will discover while using it Minitool Partition Assistant. The UI of MiniTool Partition Wizard looks complex in eyes. But, In reality, it is not complex. You can easily navigate between different functions and features. But, At first glance, it looks hard. In maximized view, it looks neat and clean. So, When you use it, maximize the window. I have used this software to check its performance. It was good to see it performed very well. Everything works perfectly. You can choose actions and after that click on Apply to finish it. Which is cool. It will allow accidental mistakes. Free version users will see all features but when they try to use them, it will ask to buy pro version. It is little confusing. Else, Everything works great. There are no major cons. Only, The UI may seem complex at first glance. Also, Free users will see pro features. But, Won’t be able to use it. Also, The price seems a bit higher. The free version is free to use. But, If you want to purchase professional versions, the price starts from $39/year/PC. But, If you want a lifetime license, the price is just 59 USD. 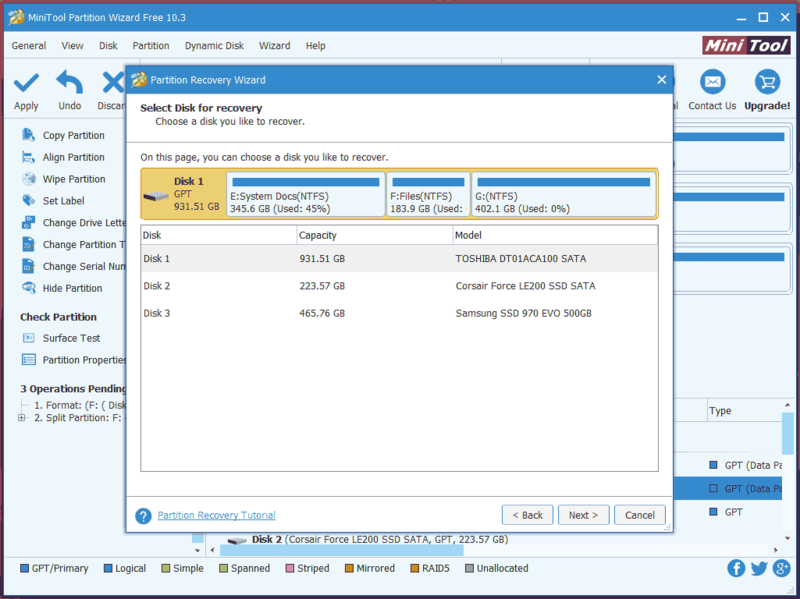 MiniTool Partition Wizard is a freemium disk management solution for Windows users. It offers a lot of functionalities. If you wish to use it, try the free version first. Then, You can purchase the professional version if you want.